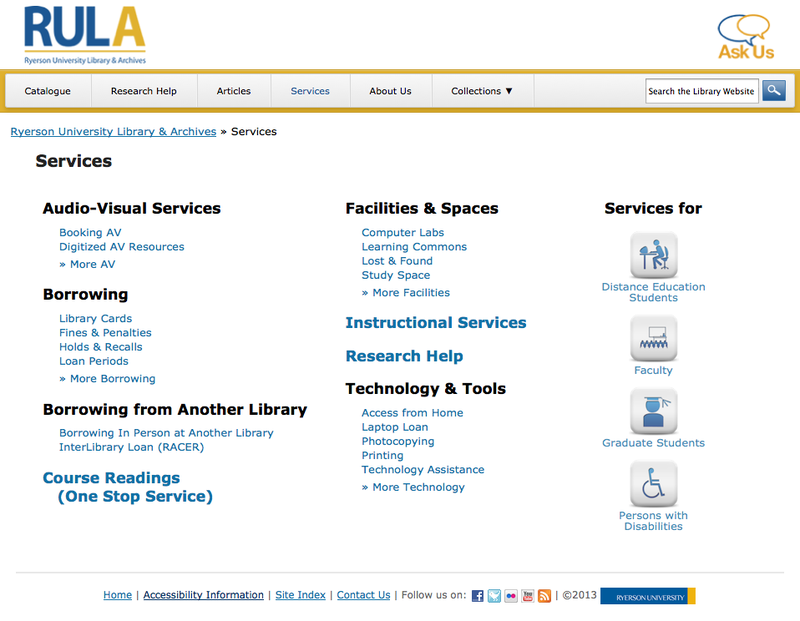 Not too long ago, I posted about the revised IA of the Services section of the website. Staff consultations followed particularly to apprise them of recommended changes and to take the opportunity to revise the content. I created mockups, which I got feedback on. Finally, the page went live. Based on the revised IA, I began an extensive consultation process with all the teams involved. While the methods differed, the most common process was by meeting with the librarian in charge, who would discuss the changes with the team and then assign a technician to help with the content revision. At other times, I just asked the librarian if they would have a problem with someone else revising the page. For the most part, the major changes were discussed with the librarians and the assigned technician took care of the detailed content revision. I also did all the revisions for the technology area, since that’s under our team’s purview. Librarians that didn’t have a technician to help, I assigned the pages to the technician who does web editing support or the co-op student (who also helped with pages that have no owners). Pretty awful, isn’t it? The old IA was a bit of a mess as well, and a lot of pages had the same information or just a single paragraph. The organization seems to have come about via the “we should make a page about this, and put it here”, meaning there doesn’t seem to have been a strict management of content. Not sure duplication of content was reviewed in any way either. Other than merging a bunch of pages and getting rid of redundant ones, I consolidated a lot of information where we needed one “authoritative” copy: hours, policies, and fines. It is particularly important that we do not have conflicting information for circulation staff, because they are the ones that deal with fines, and lost and damaged items. Obviously, this also prevents confusion and possible frustration on the part of our users. A short guideline now exists on our intranet in regards to this issue. 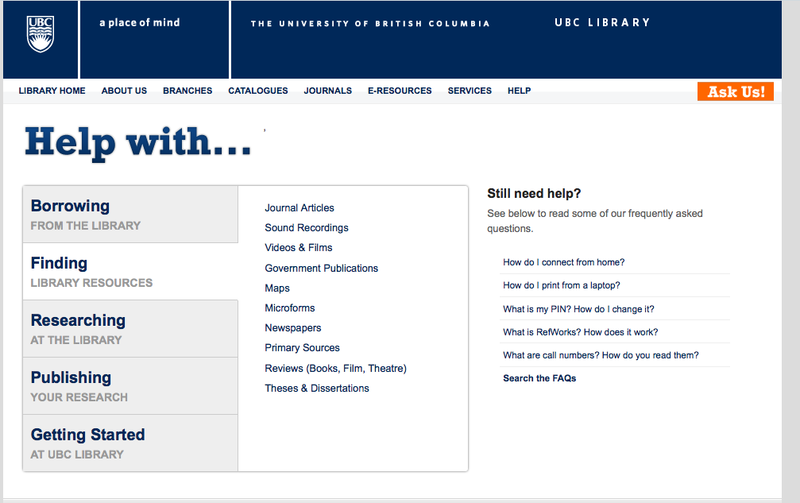 We also moved our existing FAQ pages to LibAnswers, our FAQ database. We decided to take out redundant links, and links that were not of special interest. Then, obviously, we decided to categorize them a little so it was easier to read. 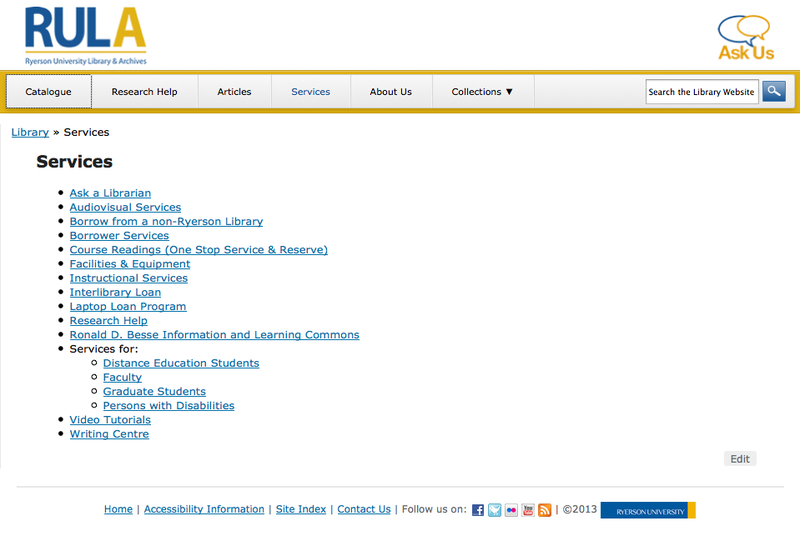 As per usual, I created a number of mockups for the web committee to review. In an attempt to make it look a little more consistent with Research Help, I used the coloured boxes motif and played around with different ways of organizing the pages. People were actually very against the boxes, and I agreed that it seemed like trying to force the look on Services. Based on the feedback on which they did prefer, I created clean black and white versions of two of the original mockups. The group preferred mockup #1 with the icons on the right hand side. After a couple of more changes based on the committee’s feedback, I posted it in the staff room and sent it out by email as well. Sadly, I didn’t get any feedback though I suppose that’s not necessarily bad. The ILL pages haven’t actually been revised yet as they were busy with their projects, but that should happen in the next little while. The page count and the new IA are based on an already revised section of ILL, so that may differ from what actually happens in the future. I also ended up writing a fairly long email to list all the changes as requested that I sent out to all staff. The final version turned out fairly well I think. Author CynthiaPosted on April 27, 2011 March 29, 2014 Categories Project workTags Services Portal, UBCLeave a comment on Personal Computers on Services live! Note: Redirects are in progress… should be done by tomorrow latest. 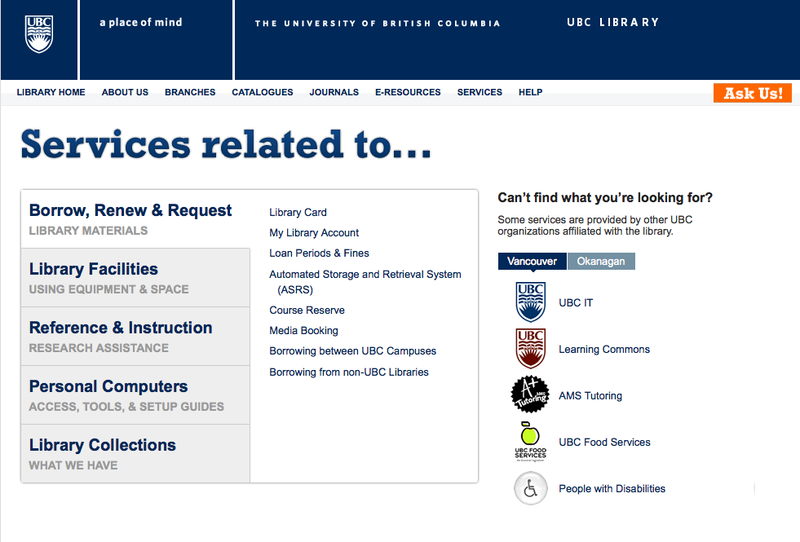 Author CynthiaPosted on February 17, 2011 March 29, 2014 Categories Project workTags Services Portal, UBCLeave a comment on Library Facilities pages moved!